Are you looking for some guidance with keyword research, keyword analysis or keyword optimization? With this guide to Keyword Analysis, we hope to provide you with a solid understanding for how to approach keywords when it comes to search engine optimization (SEO). By going through this guide, you will get a better understanding of the underlying philosophies and ideas when it comes to optimizing your webpages’ keywords for SEO-purposes. The best way to understand what someone wants is by knowing their thoughts. The closest way is to understanding what their thoughts are is to see how they type things they want into search engines. By studying the intricacies and subtle differences in what people ask in search engines, you can steer the website towards the first page of those search results! If you know someone’s thoughts, would you help them? Do you consider yourself a hopeful person? By knowing how to do keyword research and keyword analysis, you essentially set yourself up for a career for unlimited possibilities. To be limitless with your abilities, by knowing keyword analysis, you need to know how to assess the opportunities beyond face-value. Keywords have be a constant variable since the beginning of SEO. When you’re positioning your website to be at the forefront of search engine results pages (SERPs), you’re likely going to be able to draw in a lot more customers and see a spike in sales once you get to the first page (of search results). This is one of the reasons why companies and marketers have been targeting search engine traffic, and why keyword analysis and keyword research are vitally important for consideration with any digital campaign. What if keywords could tell you exactly which ones are the best to choose for you and your business? Wouldn’t that be awesome? As many people know, since the keywords won’t tell you exactly which ones are the best ones for you to target, that’s why some people choose an expert to help them get setup in the right direction. Keyword Optimization and Research is a specialty SEO service at our agency, though, there are are other great optimizers out there, too. If keywords could talk with you, what would they say? With SEO Keyword Analysis, instead of knowing someone’s thoughts, you can review what they searched and selected. SEO Keywords Analytics is essentially looking at the keywords relating to your business, and making decisions based on which types of search terms your business wants to target in search engines. Would you analyze keywords in your spare time, I mean, c’mon, seriously? SEO Keyword Analysis is, both, an art and a science. With keywords, you’re required to take a different look at word groups (search terms) and only consider the most relevant for your business. With SEO Keyword Analysis, you’re looking at a continually updated system of potential opportunities. The opportunities are more, or less “right-there” opportunities — you just have to know how to use the information by producing content that will rank. Once you know the keywords, took action from that information and then you’re indexed in search engines — you’re basically ranking first page of search results each time! When you’re thinking about keyword analysis (for SEO-purposes), you must consider the User Intent. Understanding why people are entering your website, coming from search engines is vital. Author Ron Jones suggests, essentially, that User Intent “needs to be your mental attitude as you approach keyword research.” in his 2012 book, Keyword Intelligence: Keyword Research for Search, Social and Beyond. Aligning offer with natural flows of search traffic will serve you the best in the long run. User Intent is becoming a bigger search factor as search attempt to better understand human behavior. This is an important consideration because you first want to filter out any keywords which don’t apply for your business. There’s no reason to attract web visitors that don’t apply to your business-purpose nor web visitors that won’t convert into sales. With SEO Keyword Analysis, you’re essentially looking at keywords you want to target, and analyze where you’re at now. By knowing where you’re at in terms of ranking for important keywords, you’re better able to provide yourself with a workable plan to start to rank high for keywords you want to show up for in search engines. SEO Keyword Analysis is the process of assessing the keywords you’re ranking for in search engines, and devising ideas for how you might right higher in search results. Are you looking for results or promises? By having a SEO Keyword Analysis, you can measure where you are at (for any given time period) and preparing ideas for improving your ranking for other, new keywords. Search terms are the types of words and phrases people use in search engines. By understanding which keywords you want to target for your search marketing campaigns, you can match your content ideas (on your website) and start to rank for keywords people are using in search engines. The only way to understand what people are searching for is by conducting a search term analysis. 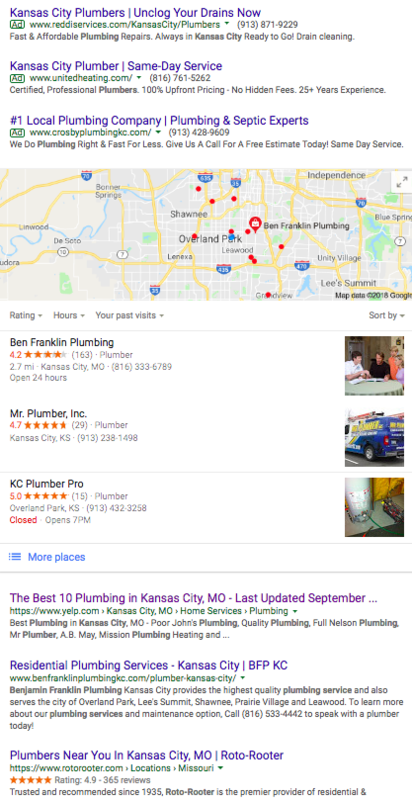 Skipping Yelp (because it’s such a large company), we check out the second result (Ben Franklin Plumbing KC). From a competitive standpoint (assuming we’re in the plumbing niche), it would be interesting to know what keywords that webpage is ranking for, right? With Search Term Analysis, we can see what that webpage is ranking. In addition,with search term analysis, I also get ideas on related keyword ideas. Keyword Research for SEO involves a certain type of mindset. For keyword research to be effective, you must emerge yourself in the data, and only recommend the keywords which have the highest potential to convert would-be customers to the site. People keyword research is so involved, a lot of companies go through an agency in order to perform the SEO Keyword Research duties needed for a campaign. Are you setup for SEO Keyword Research in-house? To perform keyword word for SEO uses, you will likely need some type of tools. Google Ads offer a Keyword Planner that is popular, though, they have also mentioned publicly that they plan to reduce the amount of visibility of keyword trends in the future. As mentioned prior, Keyword Research involves the use of premium SEO Tools. When you have access to the SEO tools, you are then able to use proprietary software to access keyword research about your specific type of business. Can you think of more keyword research ideas? There are many use-cases for how keyword research can help you achieve your goals. Many online marketers use keyword research all the type before launching successful passive income websites. Long-tail keywords typically refer to those types of searches where there are four or more words in the keyword. 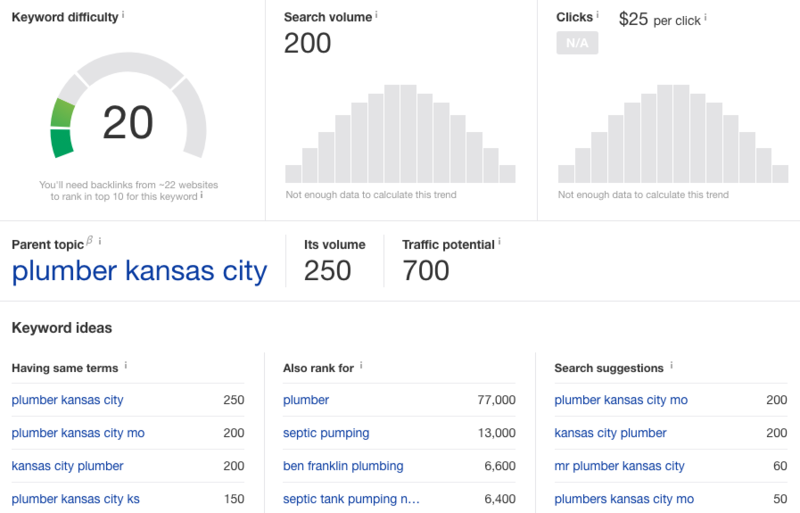 For example, “plumbers in kansas city mo” would be considered a long-tail keyword (because there are four or more words within this keyword). Do you know some long-tail keywords for your website? When searching for long-tail keywords, you can use premium SEO tools and reviews the keywords you want to target. Depending on your strategy for sourcing long-tail keywords, you might either perform some competitive analysis or you might find some ideas by reviewing your own data in Google Webmasters Tools. There are many beneficial uses for performing long-tail keyword research. Especially when you’re considering entering into a new vertical, niche keyword research can help you get a better understanding of the market. Niche research is one of the most important pre-planning aspects to launching a company, though, sometimes you must revisit what you’ve seen in the past. When’s the last time you performed a research study in your market? With Niche Keyword Research, you’re looking at a market from a high-level. For example, if you’re selling shoe laces online, you might take a look at the bigger market. For example, did you know that the secondary market for selling sneakers is a multi-million dollar industry? If you’re considering selling shoe laces, you should know about what the latest trends are involving the secondary market for selling athletic shoes. Though, you wouldn’t know this type of information if you hadn’t have done your niche keyword research. Do you compete locally or nationally, too? A great proportion of the benefits achieved from search engines is due to the aspects of the campaign you do control: that is, your website itself. By reviewing which keywords your website is ranking for, and which webpages you want to improve your rankings for in search results, you’re more in control when it comes to website keyword analysis. When’s the last keyword analysis you ran for your website? Which keywords is it actually rank for in search engines? Just by taking a look at which keywords your website is ranking for in search results, you’re more able to take corrective action in order to correct defects or to positively improve your rankings with different SEO Techniques. A Keyword Analysis Report can help you know which keywords your which of your webpages are ranking high in search results. Once you have implemented changes, and awaiting indexing from search engine crawlers, you’ll soon be able to see where search engines have placed your newly optimized webpage in search results. The only way to know for sure whether your strategy is working or not is to have a keyword analysis report. How is your website progressing– is it performing better? Serving as a baseline prior to a campaign, the keyword analysis report can provide you with insights for how your website is performing in search engine results. Depending on your goals for the SEO campaign, you can measure whether the keyword performance is: 1) trending in the direction you want, and 2) is improving as quickly as you’d like. 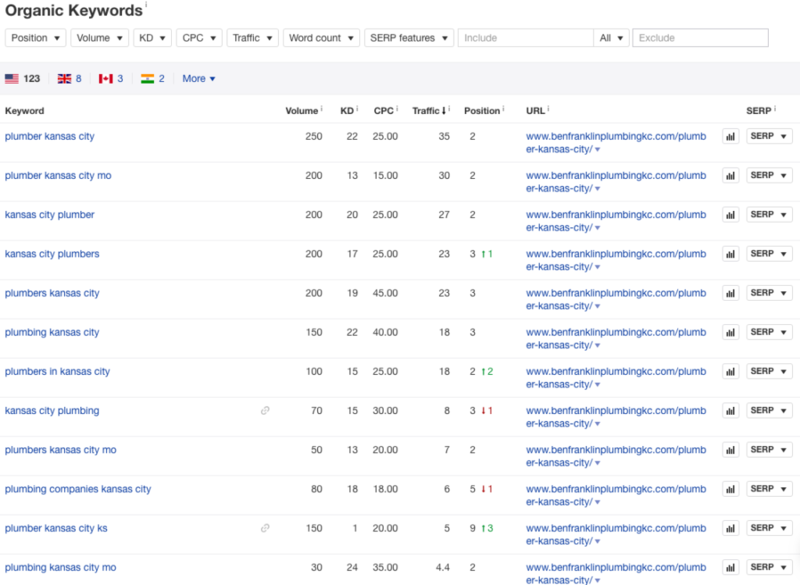 When measuring keyword performance in search engines, you can take an objective approach to measuring the performance. Oftentimes, you’re already ranking for keywords, but you might not know it. Once you know you’re ranking for a certain keyword, you can obtain the search engine position– that is which position in search results is your business website found in search results? By know the position you rank in search engines, you can then assess the progress month-to-month as you progress with your SEO Campaign. How else would you assess the keyword performance for your campaigns? For example, if you’re ranking for a valuable keyword, but you’re on Page 5 of search results, everyone knows that you’re pretty much invisible. But say, you were in position 47 (on Page 5) for a keyword, you could track that position (along with the efforts to improve your SEO keyword performance), and then measure the progress. Likely, you will travel from position 47 to a a higher position. Search engines are funny, though, so you have to test it. You might come across keyword research services often as they are being offered by select SEO agencies. Keyword research is a skill that needs applied on a regular basis for improving search marketing campaigns, just keep that in mind. Methods of the past aren’t as usable as modern methods that have been applied for recent keyword research project. for example. Who else do you consider for your keyword research needs? Are they ready and able now? Keyword Research Services have changed a lot over the years, partly due to the updates in search engine algorithms. When looking for keyword research service providers, make sure that you vet them properly. Also, be aware for which types of keywords are actually valuable for your business. It’s not difficult to be persuaded by a person into thinking that a keyword actually posses some intangible value. These types of methods are what we avoid, as being experts of keyword research puts us in an unique position when we are offering our SEO Services. By looking at Keyword Research Services, you can get a better idea for how to procure the team to help you succeed with keyword optimization and research.